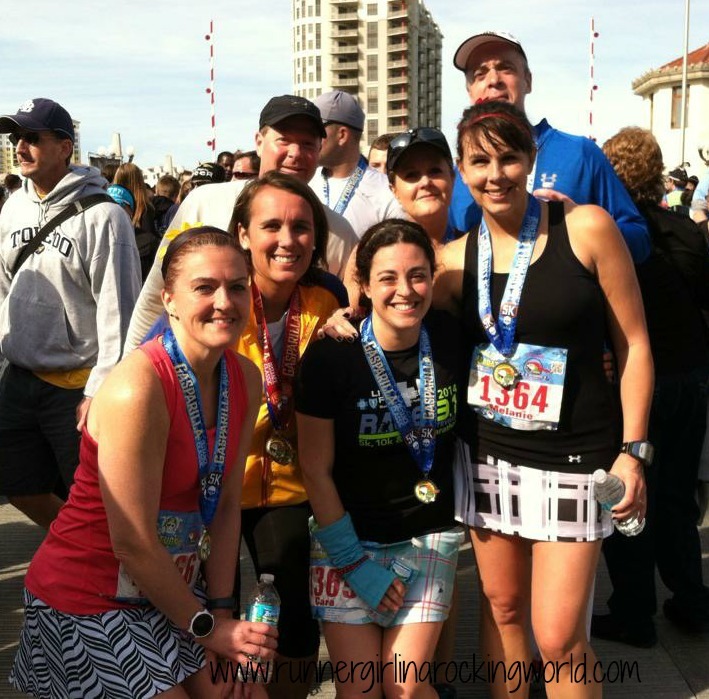 Part two of my Gasparilla Recap! With so many races and fun, it needed to be a few separate posts. 4:30am came early! But with us being so excited, it really wasn’t that bad getting up super early. We all got ready, ate some breakfast, and were headed to the race by 5:45am. Our goal was to park as close as we could to the starting line. David gave us some direction on where to park and we lucked out totally! We were less than 2 blocks from the starting line. We quickly hit the potty line and met up with Marty and David. As far as the weather, it was actually on the cool side for Florida. Race day morning was in the mid-40’s and slightly windy. We all dressed for the second race, knowing that the temperature would warm up quickly. 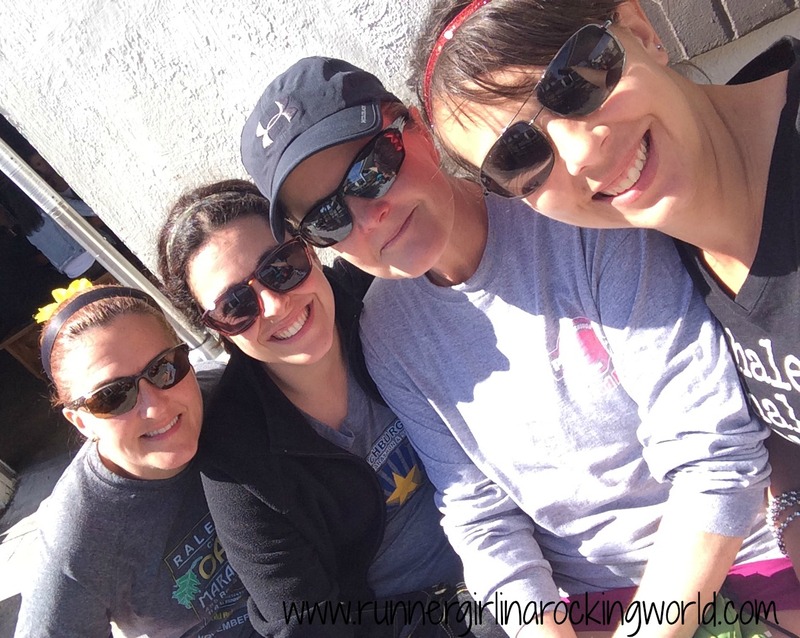 It felt perfect to us, considering we were used to running in colder temps. I was actually grateful for the colder race day mornings mostly due to the fact that I don’t do too well in hot temps. We headed to the start line and made our way to the 11 minute pace group. I was running all of the races on my heart rate and based on most of my training runs, this was a good place to start for us. At 6:45am, the horn sounded and the race was underway!! The 15K has just over 5900 runners so we were surrounded by other runners the whole race. It was crowded at the beginning, but they had all of the lanes of traffic closed so we were able to spread out pretty good. We crossed the Hillsborough River on Brorein St. The bridge kind of freaked me out. It was a metal grate bridge, the same kind in Wrightsville and where we saw runners shoes get stuck in the grating and fall. In Wrightsville, they told us to make sure we pick our feet up. Cara and I quickly told our crew to do the same. That was the last thing we needed! We made a left onto Bayshore Blvd. We quickly hit a bank of potties right after we turned and then kept on going. We ran really evenly for the first few miles, just taking in all the sights. It was mile 4 before we even realized! The course was beautiful!! Huge Florida homes lined the street on the right and the bay was on the left. There were water stops every few miles and entertainment along the course. The Rough Riders were out there passing beads! It was very festive! Just past mile 5, we hit the turn around on Gandy Road. It was great to see Marty, David and Carole! We all cheered each other on when we passed. The course is an out and back, but this time, we were on the side closer to the bay. I loved that they had the street closed down in both directions. We had plenty of room to spread out! We hit the last mile where the majority of the cameras were and we hammed it! It gave us a great boost heading towards the finish line. The race finished just shy of the Platt St bridge. Coming through the shoot, there was plenty of water and Gatorade to drink to rehydrate before the 5K. We had about 45 minutes until the 5K start so we hit the potties again before walking the short distance to the starting line. I felt great through the 15K, but just after my tummy started feeling bad and I had some mild cramping. I was trying not to think about it too much. The 5K has over 14,000 runners. In order for it to run so smoothly, they have corrals that go off every 15 minutes. Right at 9am, the first group were off. We got into the second corral that was starting at 9:15am. I decided to take a shot blok now, just in case I needed it for the 5K. I didn’t feel tired, but erred on the side of caution. We waited for maybe 10 minutes and then it was our time to start. We headed on the same course as the 15K so we were prepared for the bridge. I stuck with my heart rate and hung back for the first mile. David and I were just taking it easy. He stopped at the first water stop and I kept going. My tummy started not feeling that good and the cramping was getting a bit worse. I thought I’d stop at the next port-a-pottie but we were already passed some and we weren’t hitting the next group of them like we did in the 15K. I was stuck! I picked up my pace a bit and caught up to Cara and Christine. I hung there for a minute but then realized I need to keep moving. I was not feeling good at all. I picked it up a bit more, knowing that there were potties up ahead. Around mile 2.5, I was able to jump in one. Thank goodness!! I got back on the course and just kept running. Within another .6 mile, I was done running and was never so happy to be finished. I have never had close calls like that in a race before. I’m not sure if it was my dinner from the night before, eating the chomp, or maybe taking in too much Gatorade and I actually over hydrated myself. Either way, I was glad nothing bad happened. Marty was waiting for me at our meeting place. Everyone finished shortly after and we made our way to the post race party. This is where my only criticism of the race starts. The post race party was a mess. We were all given a bag for our post race goodies. We entered one super huge line and slowly made our way through each station. About half way through it, I couldn’t take it any more and popped out of line. After running 12+ miles, the last thing I wanted to do was to stand in line. We made our way over to where they had Coke. That’s all most of us wanted was a cold Coke. We continued walking along the water walk to the festivities. They had a beer tent, music and food trucks. Again, a mess. The beer line was ridiculously long. All the 15K runners had been hanging out for a while and now add in the 5K runners, it was close to 20,000 people hanging out. We decided that it wasn’t worth standing in line for a “free” beer so we decided to leave and head to somewhere closer to the house for food and a brew. We said our good-byes to Marty and David and would see them in the morning. We headed back to the Independent for lunch! It was so good the first day, why not?! By now the temps were up in the 70’s and it felt so nice outside! Such a treat! The race itself was really organized. There were plenty of water stops, fully stocked with water and Gatorade. There were also plenty of potties along the course too. The race course was absolutely stunning! Easily one of the prettiest courses I have ever run. When we turned back at mile 5ish, seeing Tampa in the sunrise was awesome! The crowd support was great too. Both events easily handled the amount of runners. It never felt crazy crowded and we had plenty of room thankfully to the use of all of Bayshore. The medals and swag are awesome! I love a post race party! We were all looking forward to this, but unfortunately this one was a bust for me. The lines were crazy long for post race food. The walk from the finish line to the post race party was really long. The beer lines and after party location was just too crowded. I’m not sure what else they could do to improve it. It may help if they had separate locations for the 15K and 5K. The space just can’t handle 20,000 runners. One of my biggest complaints about races is after the race…the crowd management is really poor. Even the Chicago marathon, which is one of the best races I’ve ever run (twice)–the post race party was so jammed, it took forever to move through the crowd. There were over 40,000 runners plus family and friends. It was nuts! Great job on the races..I’ve had that tummy stuff before…it’s not fun! If we were just running the 15K, we may not have noticed the crowds so much. But because of the challenge, we had that second race. It was a disappointment but one we quickly remedied. Flying Pirate is still the best post race party I’ve been to. This is the first time for me for tummy issues in a race and I was in a bit of a panic at some points. Thank goodness I knew where the potties where from the 15K!! I am glad you ran a great race! I have run the 5K a couple of times and it is one of my favorites! The course is beautiful! The after party is cool with the live band and all but I have NEVER found free food, a banana does not count and I don’t drink beer but did manage to score my friend one. Being from Central Florida we do know where some fun bars are within walking distance so it is still a favorite, hope to be there next year! Oh yes, that one thing did not ruin the experience for us at all!! Oh, that’s disappointing! 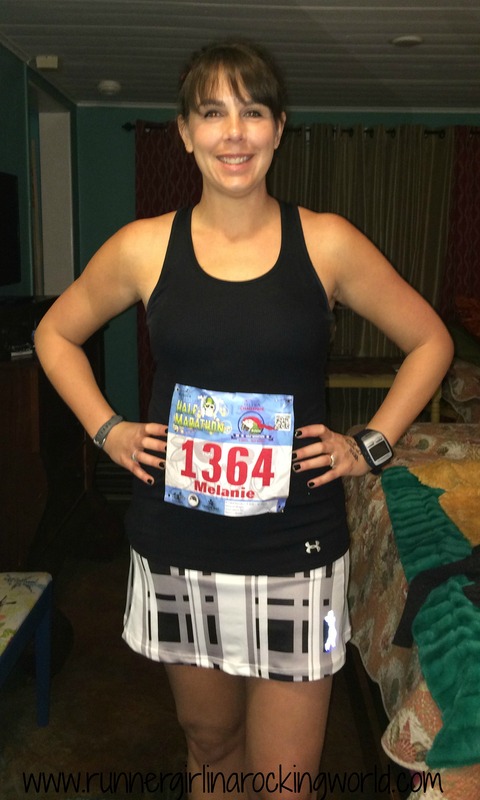 I really want to run Gasparilla – it’s such a big name race here in Florida. It’s a shame they don’t seem able to handle the crowds of runners. Maybe they got enough feedback so that they will decide to make positive changes for the future. I’m sorry you had the tummy issues. I usually pop an Immodium or two before a race, just as prevention. My stomach can go absolutely wonky before and during races and I don’t want to get stuck in a bad situation out on the course. I agree that the Gasparilla course is beautiful! It was my first timed 5k last year and I loved the course. I don’t remember running over a bridge though so maybe they changed the course this year? The houses are gorgeous and the water is also pretty! I do remember seeing some dolphins while running which was cool! I also agree that the post race is kinda messy there. There were so many people in the 5k last year (I think 10,500) that it was crowded trying to get our post race fuel and pictures and the walk to the park where they held the after party was just too long (and it was pouring rain last year when I finished). I didn’t go for my free beer either. I just chilled at the expo a bit and then headed home. Dolphins?! That is awesome!! I would have loved to have seen them. The walk to the park was long too. We weren’t sure we were even going the right way. It was all good though. We were happy with heading to our new found fav restaurant near our house. Yes indeed the Gasparilla crowds can get to be a bit huge. I’m glad they finally put a cap on the races this year. I think it has been long overdue and they could probably even cap it at a slightly smaller number. The races handled the number of runners beautifully! I think the caps are smart. I couldn’t imagine any more people.